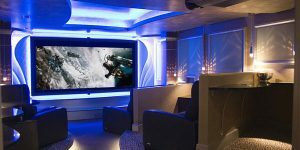 From TVs to cinema-style projectors, we offer a range of high-definition products to create the viewing experience you desire. With our sealed and waterproof units, you can sit back and soak in the tub while watching your favourite show. We offer a full range of satellite subscription services, to give you all the channels you want with none of the hassle. When fully integrated with our audio solutions, you can say goodbye to juggling between remotes: our entire system can be controlled through one easy-to-use touchpad.